DESOTO—As the DeSoto Eagles prepare for the biggest game of their lives, a bit of good news was announced on Monday. Gatorade named DeSoto Senior Quarterback Shawn Robinson as their Texas Football Player of the Year. In its 32nd year, Robinson is the first Gatorade Texas Football Player of the Year from DeSoto High School. The award not only recognizes athletic excellence, but academic achievement and exemplary character demonstrated on and off the field. Robinson joins an elite alumni association of state award-winners in 12 sports. 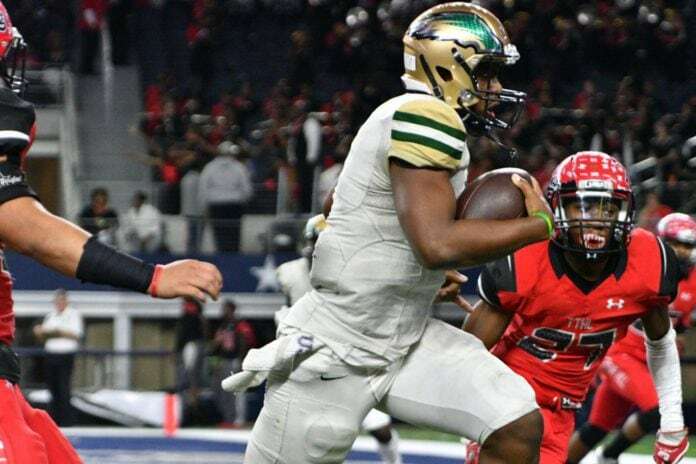 The 6-foot-1, 217-pound Texas Christian University commit has led the Eagles to a 15-0 record and the upcoming Class 6A Division II State Championship. 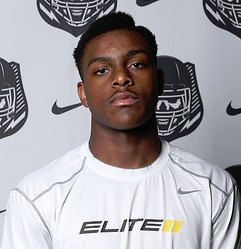 Robinson had completed 167 of 286 passes for 3,052 yards and 26 touchdowns through 14 games. He had also rushed for 1,139 yards and 17 touchdowns on 120 carries. Robinson knows the game well. He is the son of two DeSoto coaches. Father Othell Robinson is on the varsity football staff and Andrea Robinson leads the girls varsity basketball team. Some call him a coach’s dream. “Shawn gets better every day; he’s natural leader,” says DeSoto Head Football Coach Todd Peterman. But more than anything, Coach Peterman notes that Robinson’s commitment is the strongest attribute that will take him places. This is just one of the many laurels Robinson has earned. Seems like you can’t swing a cat in DeSoto and not hit a Shawn Robinson award. Last month he was a finalist in the Mr. Texas Football Contest, sponsored by Wells Fargo Bank. Prior to that, he was named the 6A Ford Player of the Week. In September, he was tapped to play in the 2017 U.S. Army All-American Bowl. “I know he is really excited about representing his country and school,” said Head Coach Todd Peterman. The 2017 U.S. Army All-American Bowl will air live January 7, 12:00 p.m. CST on NBC. Army All-American players are mentally and physically agile; able to adapt to challenging situations, similar to U.S. Army Soldiers. Robinson has maintained a 3.59 GPA in the classroom. He was named to the Texas Academic All-State Team on Tuesday. DeSoto lead the area with 18 student-athletes making the grade. “Our students must first succeed in the classroom before they can excel on the field,” said Peterman. He has volunteered locally feeding the homeless and has participated in an elementary school reading initiative. Even Robinson’s former coaches have nothing but glowing remarks about the student-athlete. 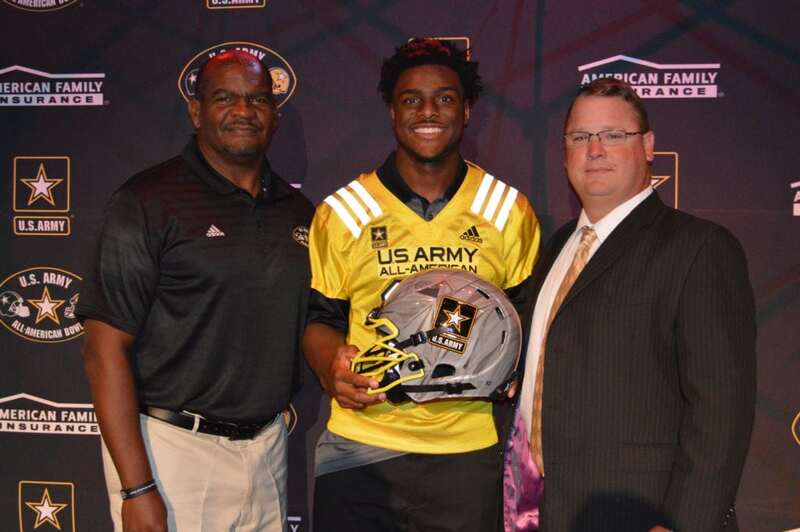 Shawn Robinson holds the Army All-American helmet with Anthony Williams, Texas Dir. Of Player Development /Scouting for the All-American Games and DeSoto Eagles Head Coach Todd Peterman. The Gatorade Player of the Year program recognizes one winner in each of the 50 states. It’s not only football, but volleyball, cross country, basketball, soccer, baseball, softball and track & field. The selection process is administered by the Gatorade Player of the Year Selection Committee. The committee is comprised of sport-specific experts and a media advisory board of veteran sports journalists. Robinson joins recent Gatorade Texas Football Players of the Year Tren’Davian Dickson (2015-16, Navasota High School), Kyler Murray (2014-15 & 2013-14, Allen High School), Kenny Hill (2012-13, Southlake Carroll High School), Johnathan Gray (2011–12 & 2010-11, Aledo High School), and Scotty Young (2009-10, Billy Ryan High School) among the state’s list of former award winners. As a Gatorade Player of the Year, Robinson will be able to select a national or local youth sports organization to receive a grant as part of the Gatorade Play It Forward program.